Brahmā is the Hindu god (deva) of creation and one of the Trimūrti, the others being Viṣņu and Śiva. According to the Brahmā Purāņa, he is the father of Manu, and from Manu all human beings are descended. In the Rāmāyaņa and the Mahābhārata, he is often referred to as the progenitor or great grandsire of all human beings. He is not to be confused with the Supreme Cosmic Spirit in Hindu Vedānta philosophy known as Brahman, which is genderless. Brahmā's wife is Saraswati. Saraswati is also known by names such as Sāvitri and Gāyatri, and has taken different forms throughout history. Saraswati is the Vedic Goddess, revered as Vedamāta, meaning Mother of the Vedas. Brahmā is often identified with Prajāpati, a Vedic deity. Being the husband of Saraswati or Vaac Devi (the Goddess of Speech), Brahma is also known as "Vaagish," meaning "Lord of Speech and Sound." Brahma and his consort Saraswati, represent the vedas, their spirit and meaning. 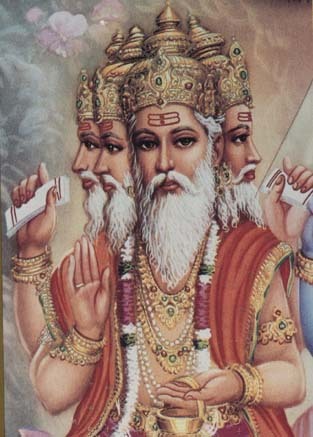 They form the subject of many tales in Hindu literature. All knowledge, religious and secular emanate from them. The name Narayana (one dwelling in the causal water, the abode of man) was applied to him first and later to Vishnu. The Avataras (incarnations) of fish (matsya) and tortoise (koorma) (later called the avataras of Vishnu), the boar (varaha) to raise the earth from under the waters and created the world, the sages, and prajapatis were all attributed to Brahma originally and shifted to Vishnu later. Brahma, created all knowledge, sciences, arts, music, dance and drama. He also officiated over the wedding of Shiva and Parvati.